Since 2010, there has been a resurgence in violent conflict across the world and a marked increase in the number of armed conflicts. Conflicts have also become more complex, fragmented and protracted. 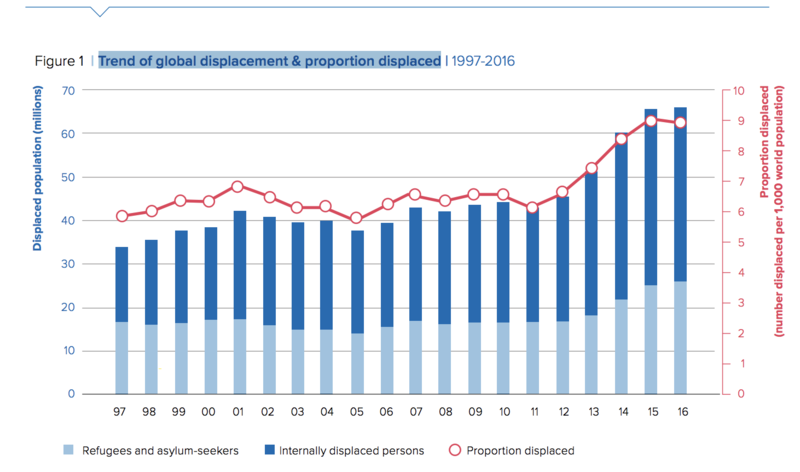 By the end of 2016, over 65 million people had been forced to flee their homes due to conflict, violence, repression or disaster — the highest level recorded since World War II. Violent conflict destroys lives, ruptures societies, damages institutions and infrastructure and, as is now well known, sets back development by decades. At the same time, we are witnessing a reinvigorated worldwide attempt to tackle poverty, exclusion, injustice and conflict through the commitment of the world’s states to meeting the 17 Sustainable Development Goals (SDGs). Despite the promise of the 2030 Agenda, however, and its assertion that ‘there can be no sustainable development without peace, and no peace without sustainable development’, it is projected that by 2030 over 50% of the world’s poor will be living in conflict-affected settings. In this alarming context, the UN Secretary-General, António Guterres, has issued a ‘red alert’ for the world and set out a broad agenda for conflict prevention. The new agenda is rooted in the observation that too much time and resources are spent reacting to the symptoms of and managing conflict, and not enough on preventing its initial outbreak, which would not only save lives and prevent human suffering, but also cost less. Conflict prevention has historically been undervalued and underprioritized. Three recent reviews of the UN instruments for peace and security—the peacebuilding architecture, UN peacekeeping and the Women, Peace and Security agenda—have underscored the need for the UN to revise its approach in view of the changing dynamics of conflict. The peacebuilding review specifically introduced the concept of ‘sustaining peace’. This has conflict prevention at its core not just in terms of preventing a relapse into conflict, or ‘post-conflict peacebuilding’, but also of preventing its initial outbreak. In April 2016, through twin resolutions in the UN General Assembly and Security Council, sustaining peace was made the new overarching framework for the entire UN. Sustaining peace is ‘a goal and a process to build a common vision of a society, ensuring that the needs of all segments of the population are taken into account, which encompasses activities aimed at preventing the outbreak, escalation, continuation and recurrence of conflict, addressing root causes, assisting parties to conflict to end hostilities, ensuring national reconciliation and moving towards recovery, reconstruction and development’. It calls for conflict prevention to be addressed at all stages— before, during and after conflict. A primary focus is on the root causes of conflict, and thus on building resilient national and local institutions and processes—political, socio-economic, security and justice—to sustain peace through, for example, mediating disputes, fostering inclusion and preventing conflict. The capacities and agency of the affected society and state have been made primary in sustaining peace. In addition, for the first time, a comprehensive approach to conflict prevention is being undertaken as the entire UN and its affiliated programmes, funds and agencies have been given a responsibility to engage in sustaining peace and conflict prevention by addressing the root causes of conflict. Conflict prevention seeks to strengthen local capacities for peace by making societies more resilient to violent conflict and therefore more capable of sustaining peace. Conflict prevention experts identify three types of prevention. Direct prevention involves short-term operational initiatives that aim to intervene at a critical moment in order to de-escalate tensions or defuse the risk of imminent conflict between identified actors. Structural prevention, by contrast, involves longer-term efforts across a variety of sectors to address the deep societal conditions that lead to conflict, such as development initiatives that target the root causes of grievance and violence and seek to build effective governance and rule of law institutions. Systemic prevention is the term coined by the then UN Secretary-General, Kofi Annan, to describe ‘measures to address global risk of conflict that transcend particular states’. These require international partnerships and frameworks, such as treaties, and normative regimes to tackle them effectively, as in the case of climate change and HIV/Aids, as well as transnational organized crime and the global arms trade. Police in peace operations can contribute to all three types of conflict prevention. The contributions of peace operations to conflict prevention are less frequently explored in the conflict prevention literature. This is possibly because peacekeeping is considered primarily to be a conflict management instrument developed as a response by the international community to the outbreak of conflict. According to the UN ‘Capstone Doctrine’, multidimensional peacekeeping missions ‘are typically deployed in the dangerous aftermath of a violent internal conflict and may employ a mix of military, police and civilian capabilities to support the implementation of a comprehensive peace agreement’. Increasingly, however, they are deployed to unstable contexts where combatants have yet to sign a peace agreement or have failed to implement one that has been agreed. It is important to note that even the UN’s largest peacekeeping missions are tiny in relation to the host population and can make only modest contributions to stabilization and providing some measure of security and assistance to the host state in rebuilding institutional capacity in conflict-affected states. For example, the Democratic Republic of the Congo is a country roughly two-thirds the size of Western Europe (2.3 million square kilometres) with a population of 84 million. Much of it has only limited infrastructure. As of April 2018, 15,804 military personnel and 1361 police were deployed to the United Nations Organization Stabilization Mission in the Democratic Republic of the Congo (MONUSCO). By way of comparison, London comprises 8.5 million people and is policed by some 31,000 police officers. Nonetheless, despite these caveats, peace operations make diverse contributions to all three types of conflict prevention. Peace operations engage in direct conflict prevention by deploying uniformed forces to de-escalate tensions and deter violence. Research has provided evidence that the presence of peacekeepers reduces the risk of relapse into conflict and reduces battle-related deaths in post-conflict settings. Second, multidimensional peace operations provide structural conflict prevention through the support they provide to host state authorities in transforming or strengthening national political, security, justice, rule of law and socio-economic institutions. Research has found that state institutional weakness and a lack of state control over its territory are key predictors of internal conflict. Conversely, states with high levels of institutional capacity in terms of a well-financed and competent administration can better provide public goods for their citizens, resulting in fewer grievances against the government. What’s the future of UN peacekeeping? Furthermore, states with high levels of institutional capacity, and which enjoy a degree of trust and legitimacy in the eyes of their citizens, have stronger rule of law and are better able to manage societal strains, and while complying with human rights, can deter and respond to violence and restore order when it is disrupted. As Secretary-General Guterres notes, ‘investment in capacity and institution-building of States is another central element of prevention, promoting inclusive and sustainable development, overcoming fragilities and strengthening the ability of Governments to address the needs of their people and respect their rights’. Third, peace operations contribute to systemic conflict prevention through their promotion of and support for international norms, and the legal agreements and regulatory regimes which govern transnational phenomena that jeopardize peace such as environmental degradation, illicit arms and financial flows, and human trafficking. Peace operations promote respect for human rights in their activities to combat transnational threats and in cooperation with relevant entities such as the Office of the United Nations High Commissioner for Human Rights (OHCHR), the United Nations Development Programme (UNDP), and the United Nations Office on Drugs and Crime (UNODC).